This is part of a local history note on Sir Richard and Lady Isabel Burton. See the start of this local history note. Richard died on 20 October 1890 in Trieste and Isabel’s first act was to go through his papers and burn what she thought unfit for publication, exactly what was included is still not clear. Four days after Richard’s death a funeral was held, Trieste gave him a full military funeral “such as is only accorded to Royalty.” All the flags in the city were lowered to half-mast and it was said that most of the 150,000 inhabitants turned out to watch as his coffin “covered in the Union Jack” was escorted by the Consular Corps in full dress uniform to St, Mary’s Church. After the service, the coffin was placed in a consecrated room at the small burial ground behind the church to await shipment home to England. Isabel now had the task of packing up all their belongings for the journey home, all the rooms were crammed with furniture and items collected on their travels. It is estimated that there were about 8,000 books in the house. She then left for London on January 27; her luggage consisted of 25 packing cases, but left 125 cases behind in Trieste as she could not afford to ship them back. Richard’s body was shipped home and was met at Liverpool by Isabel. A train brought the coffin to Euston Station and then a hearse took Richard on his last journey to Mortlake. 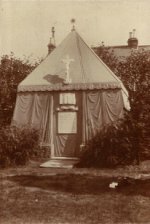 His body was laid in the crypt under the altar in St. Mary Magdalene’s church as the marble and stone tent would not be ready until May. Sir Richard Burton's mausoleum, Mortlake Cemetery. Photograph. Isabel made regular visits to Richard’s grave from her home in Baker Street and on one of these visits she noticed that a small cottage close to the churchyard was available for rent. She justified the rental by saving the fare travelling to and fro from London and that it would be more pleasant in Mortlake than central London in the summer. She had a name-plate made for "Our Cottage" and planted roses, ivy and honeysuckle round the front door. She now needed morphine injections to help her cope with the pain of the cancer, but she was determined to republish 34 of Richard’s works in a Memorial Edition. In only 8 months she finished the 2-volume biography of Richard, The Life of Captain Sir Richard Francis Burton, which was published on 11 July 1893. By 1895, Isabel was having difficulty in walking and, in the summer, a bout of influenza and a bad attack of abdominal pain meant that she was unable to progress very far on her own autobiography. So she contacted W.H. Wilkins and asked him to help her when she was able to return to the project. She moved down to Eastbourne in September of that year where she stayed until the following March when she returned to London. She died on 22 March and was buried by her husband’s side at Mortlake. Wilkins’s book, The Romance of Isabel Burton, was published in 1897. By 1973 the tomb was in a terrible state of repair. Vandals had broken in and the door had been damaged, so the entrance had been bricked up and plastered. The stained-glass window at the back had been smashed and therefore boarded up. The tomb was surrounded with weeds and overgrown trees. The outside was covered with lichen and the gilt had been lost from the Star of Bethlehem and the Muslim crescents. A fund was started to repair the tomb and £2,000 was raised from various sources. On 17 June 1975 a ceremony was held to mark the end of the restoration work.